Patricia O’Sullivan asks if anyone has knowledge of any relations of William Lysaught (1835-1910), born Co. Cork, Ireland. 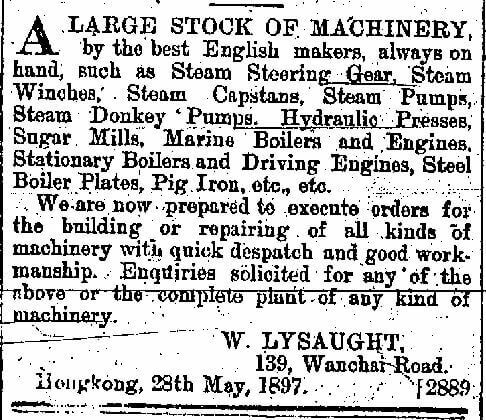 Lysaught was an Inspector in the Naval Dockyard Police HK, and owner of William Lysaught & Sons, Wanchai Machinery Godowns and Engineering Establishment, which as this May 1897 advert shows had premises at 1 to 8 Cross Lane in Wanchai at that time. 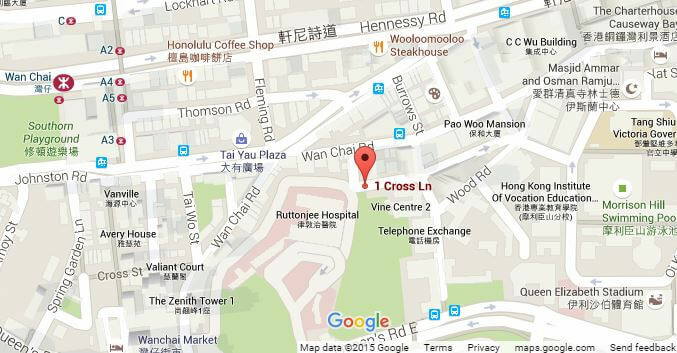 The company(ies) seems to have had an office at nearby 139 Wanchai Road. Our group would be interested if anyone can also provide additional information about the man, his company and the Wanchai MG& EE. The advert suggests that none of the listed machinery was manufactured in Hong Kong, though the phrase, “We are now prepared to execute orders for the building…of all kinds of machinery” is intriguing. William Lysaught died in Hong Kong. Further information about him and what Patricia has found out about his family can be found in the gwulo.com link below. Hallo Patricia, I am William Lysaught great grand daughter , my great grand father got marry with Lilian Lysaught they have 2 kids. One is my grand father named Guglielmo, that is italian name for William. I live in Italy , my name is Clara Cattaneo!